Cool Hand Burg: Sometimes guidebooks lie. It's not that this was a "bad" restaurant, because frankly even frozen pizzas made in Italy taste pretty good (Karen knows, don't ask.) It's just not good enough to talk about. 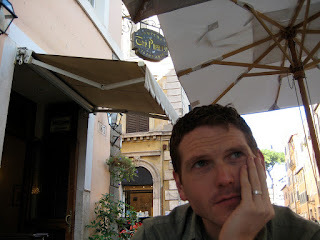 And not 1, but 2 guidebooks mentioned this as a place to eat near the Vatican. Karen is taking this as further evidence for a need for her to start a travel magazine/book series/blog. You'd read that, right?